The cover of the book had me fascinated and so did the title... Blinkers off by Andaleeb Wajid is the kind of book you should read after a packed tiring day.... The book is light, while being deep; It is fun while being serious and it makes for a breezy read. While reading this book, i realized once again it is not necessary for a book to be heavy duty, filled with high tech words and have complex characters for it to be interesting. The book is all about "Noor". Like every other college girl, Noor goes through her set of conflicts and ideas.She dreams of becoming a screen play writer, ergo taking the documentary making classes very seriously. When she comes across Dennis, the suave good looking guy who is almost like a Knight in the shining Armour, her heart skips a beat and emotions run amok. And then, there is her family... She is out late working on projects, her parents, especially her mom is unhappy with this and even comments that Noor should stop the course. And then there is her team mate Supriya, who is anything but a team mate, quite the contrary! Supriya bugs her to no end, her Diva like attitude, good looks and of course the fact that she is all over Dennis... But, it is thanks to Dennis that Noor is able to get through the ordeal and get her documentary done and finished. Noor has to not only manage her team mates, but guard the Bride's dark secret, put up with Supriya and her tantrums, keep her feelings to herself and remain focussed on the taks at hand- The Documentary! 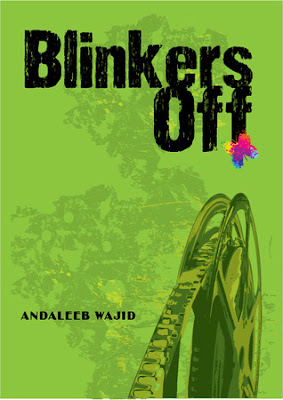 As things come to a head during the wedding, Noor realizes there is no easy way out or a solution in sight, and i guess that is the curx of Blinkers off. After reading the "Maximum City" by Suketu Mehta, "Love and Longing in Bombay" by Vikram Chandra and ofcourse "Shantaram" by Gregory David Roberts, I was now onto reading yet another book on the Buzzing city of Mumbai- "Saraswati Park" by Anjali Joseph. This book has been nominated for the Vodafone-Crossword Award for 2011 under Fiction category! Saraswati Park is a fascinating story about a simple family who call Bombay their home. 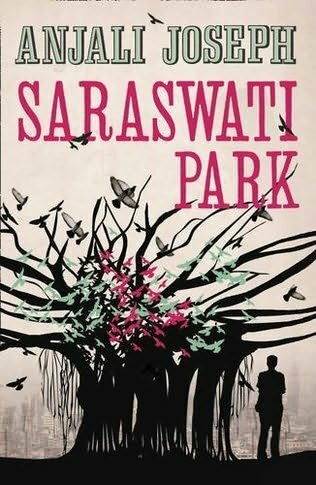 The book is a vivid description of the city and how many lives are entwined within it..
Saraswati Park is where Ashish goes through a transformation. Saraswati Park is the place that is the hub of emotions, personalities and a reflection of the city that is alive through the day. Saraswati Park is a book that is Mohan’s story. Mohan Karekar is a letter writer who helps translate others thoughts into words day in and out, sitting outside the post office. He loves to read, aspires to write a book one day and is very concerned about the changes happening around him. Mohan and Lakshmi lead a very simple and almost staid life, what with their children being away from home and his job being a monotonous one. Though everything looks happy and dandy, there is a lot brewing underneath, that causes quite a bit of tension between the couple, and it is visible their marriage is crumbling like the words that are stuck in Mohan's mind. A group of pigeons flew out of the old tree and into the sky, their wings making the sound of wind on the sea; they criss-crossed each other and made for the west. He tucked the new book under his arm and returned to the station, where a Harbour Line train was pulling into platform two. Things do change a bit when Ashish, Mohan's nephew comes to live with them and hopefully turn his life around, especially studies. Ashish is a 19year old teenager majoring in English literature and going through a confused phase, primarily related to his sexual preferences. Saraswati Park, the book takes us along the journey that these three different characters go through, giving us a glimpse of what each of their lives are like and what is it that holds them together, or not. The crux of the book is when Lakshmi's brother Satish passes away, and Mohan is left to take care of organising the last rites, to being there when the will is executed. Satish leaves all his posessions to Ashish, who is not a blood relative but someone he cares about. With each passing day Mohan immerses himself in the books and writing, almost ignoring Lakshmi and her desiers. Using this as an excuse, Lakshmi goes away to her hometown, leaving Mohan wondering if she is alright and if he has done something to upset her. After a brief spell of seperation, Mohan finally gives in and goes to bring Lakshmi back where she belongs. All the while Ashish is going through his own set of worries and turmoils, not to forget Professor Narayan who is tutoring him not just in English Literature but on life as well. He is torn between feelings for the Professor, which ends up in heart break when his professor ends all ties with him. Thanks to his friend, Ashish matures and moves on, going to USA for further studies, trying to put the professor episode behind him, albeit with one final phone call while waiting for his flight to board. Anjali has managed to keep the flow going beautifully, giving us readers something to ponder on with every page. Though the pace of the book is slow and some parts seem lame, it is overall a good read. For people who have been to or lived in Mumbai, the spirit of the city will definitely have them smiling and reminiscing. Good luck on the award, Anjali!! The seventh edition of The Hindu MetroPlus Theatre Fest 2011 will happen this August. the Fest — which was launched in Chennai in 2005 and held annually ever since — will run in five cities. Over the month, it will feature 20 performances in five cities. The Blue Mug by The Company Theatre from Mumbai. If you are a theater buff, heck if you are someone who has never been to a PLay before, its time you set aside an hour one evening and head over to Sir Muthu Venkata Subbarao Hall in Lady Andal School, Harrington Road!! 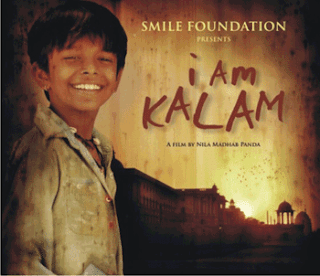 I am Kalam is the endearing story of a little boy who transforms from Chottu to Kalam and has big dreams for himself. His one aspiration is to wear a Tie, and be respected by many :) The movie reinforces the "Keep dreaming and keep aspiring to fulfil those dreams"
Chottu[Harsh Mayar] is a bright eager to learn kid who is left at a Dhabba[in the outskirts of Rajasthan] run by Bhati[ Gulshan Grover] by his mom so he can earn some money. He wins the heart of not only Bhati, but all the visitors, especially the foreigners, and makes sure to learn something from each of them. The enthusiasm and zeal he has for learning is just infectious. And then there is Laptain [Pitobash from Shor in the City]. Chottu spends the few minutes he gets between cleaning up dishes and serving customers. Lucy (Beatrice Ordeix), the french tourist who had held Bhati captivated breaks his heart when she tells him she is married and her husband is in Delhi. She infact promises Kalam that she'l take him to Delhi but leaves in a hurry, breaking his heart as well..